Monitor, keyboard, mouse for Pi desktop mode or a laptop if connecting remotely via SSH. To create a simple app for hearing locals radio stations, just connect an I2C TEA5767 to your Raspberry Pi 2 (RPI2). TEA5767 is a module that uses the I2C serial protocol and it is ideal for connecting to an RPI2. No I2C background knowledge is needed. To learn more about I2C click here. For more information about the TEA5767 click here. 2. Make sure to set the ‘Remote Debugging’ setting to point to your device and select ARM. Note: this app requires physical I2C ports and will not work if running in an emulated environment. 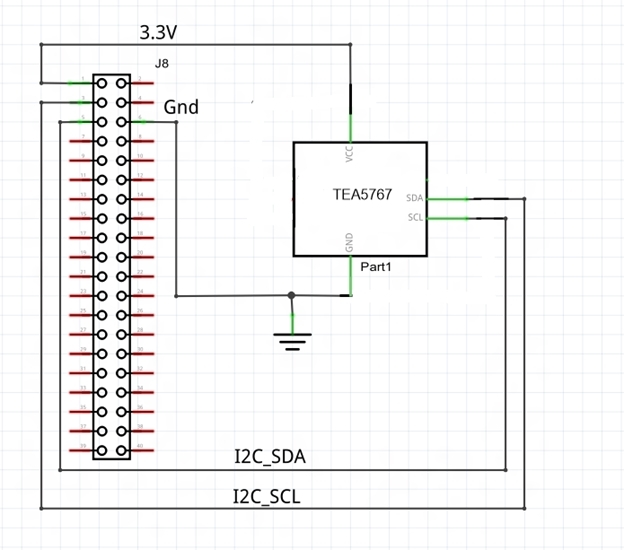 We need to hook up power, ground, and the I2C lines to the TEA5767. Those familiar with I2C know that normally pull-up resistors need to be installed. However, the Raspberry Pi 2 already has pull-up resistors on its I2C pins, so we don’t need to add any additional external pull-ups here. See the Raspberry Pi 2 pin mapping page for more details on the RPi2 IO pins. Note: Make sure to power off the RPi2 when connecting your circuit. This is good practice to reduce the chance of an accidental short circuit during construction. SDA: Connect to SDA on the RPi2 (Pin 3). This is the data line for the I2C bus. SCL: Connect to SCL on the RPi2 (Pin 5). This is the clock line for the I2C bus. When everything is set up, power your device back on, and open up the sample app in Visual Studio. Configure the TEA5767_I2C_ADDR String with the address of the device. In this case, we use 0x60 [hexadecimal], just like explain the TEA5767 datasheet. This project use the MainPage for manage all the function and it divide by MainPage.xaml and MainPage.cs. The MainPage.xaml contains the FM Radio Display and the user interface of the FM Radio app. Congratulations! The I2C TEA5767 is connected. 2. Read from the TEA5756 the defined frequencies and update the display. Let’s start by digging into the initializations. First, we create an I2CConnectionSettings object with the TEA5767 address “TEA5756_I2C_ADDR” (0x60). Next, we get the class selection string for our I2C controller. This controller controls the I2C lines on the exposed pin header. If the device does not have a connected controller, this function will throw an exception. This may happen if you run the app on a desktop machine. Finally, we create a new I2C device with the settings and bus controllers obtained previously. string aqs = I2cDevice.GetDeviceSelector("I2C1"); // Get a selector string for bus "I2C1"
Now that the I2C Device TEA5767 instance is set the I2C bus initialization is done. It’s now possible to write and read data over I2C to start up the FM Radio Station. This is done with the Write() and Read() functions. To set the frequency, some internal registers need to be configured before the device can be used. The data format register has 5 data bytes [byte#1][byte#2][ byte#3][ byte#4][ byte#5]. So a byte object is needed to read and write on the buffer. The Write() function is needed to set a frequency. Configure the byte object calling the writeBuf function. If you need information about the register click here. The Read() function is used to read a Frequency. Configure the byte object calling the readBuf function. If you need information about the register click here. I made a little demo to demonstrate how it works. (FM Radio.git). In this demo you can write, read and search local radio stations available using a graphical user interface. /// An empty page that can be used on its own or navigated to within a Frame. string aqs = I2cDevice.GetDeviceSelector("I2C1");  // Get a selector string for bus "I2C1"